Dhoni though didn't lose his cool with the bat and helped India win the game. 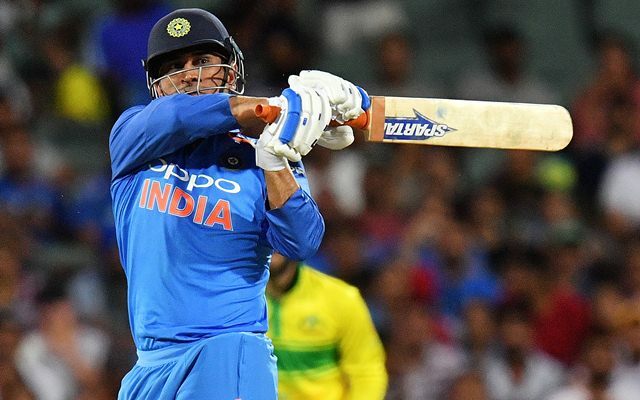 Very seldom does it happen that MS Dhoni loses his cool and that too on the day when he finished the game for India at the Adelaide Oval to level the series. The veteran’s unbeaten and calm 55-run knock helped the visitors seal the nervy chase which went down to the last over. However, during the drinks break when the things got close Dhoni was seen getting angry over the waterboy Khaleel Ahmed for walking in the middle of the pitch. Extreme heat in Adelaide was taking a toll on the players during the game. Moreover, MS Dhoni was at the receiving end as he ran a lot of singles and doubles which has become a feature of his innings nowadays. Even when the required run-rate had touched nine, the experienced campaigner ran out of his skins along with Dinesh Karthik without hitting many boundaries. His fitness was challenged on the day and when he called for drinks during the final overs of the game, Khaleel came running in only to face the wrath of the former Indian captain. The left-arm pacer who was benched for this game actually came in to serve drinks for Karthik and walking on the pitch didn’t please Dhoni by any means. Walking on the pitch with the spikes on the shoes can damage the 22 yards and make it tough for the batsmen. With the game getting ever so close, MS Dhoni was in no mood to take any chances and he wasn’t impressed with Khaleel Ahmed at all. He was seen gesturing Khaleel that he could’ve avoided walking on the wicket and hurled abuses at him. At the same time, Yuzvendra Chahal, aware of the threat, was seen throwing the helmet towards MS Dhoni from the other side of the pitch. Despite losing his cool at that moment, the 37-year-old didn’t let it affect his performance in the game and successfully managed to take India home.